For a few lessons, starting from today, we shall consider how we can build on what we know already. Let’s look at words and sentences. A child/beginner needs to be able to recognise words in a text, but that in its own is not really sufficient. They need to recognise those words in the context, in order to avoid attaching a different meaning to those words than the precise one they have in that context. As a parent, listening to your child fluently reading a passage in English, you may think that your child is actually good at reading. But if, for example, that child doesn’t grasp the meaning of the sentence or the paragraph, because (s)he attributes another meaning to some words than the correct one, then your impression of their proficiency is wrong and it will be just a matter of time until you discover (s)he is not actually good at reading in English. The more you let time go by, before you catch their deficiencies, the more they will have to repeat learning the same vocabulary again, until they get it right and this can be very off-putting. Just as an example, if we have the sentence “Don’t worry, I’ll catch you up” – a young child may think of the phrasal verb ‘catch up’ as seizing somebody by the upper arm, as in playing tag. Instead, it means to walk fast enough, to get to overtake the other person in front. There are hundreds of verbs like this, but these are not the only source of confusion when reading. There are many books with exercises on this subject and the Internet is full of free resources that are actually full of fun – a luxury I didn’t have as I grew up. One could spend hours and days on one’s favourite word games, like the men who gather around an improvised board on the street pavement, on a sunny afternoon to play their Chinese chess game while forgetting the world around them. Let me recommend some of the best websites for building vocabulary for reading purposes. For children, you’ll find stories like the following story by Beatrix Potter . They all come with some vocabulary activities prior to the reading and exercises after the reading. You can also download and print the transcripts, the exercises and the key to the exercises – all for free! All you need to do is subscribe to the website, which is also free. Otherwise, you can read and play the games, but you won’t have access to the printouts. For teenagers, you can check this: TeensReading introduction . The above is the main page for reading skills and the one below is an example of a reading piece for A1 = beginners: TeensReading [Finding a Home] . The same applies on this page – you can download and print the transcripts, the exercises and the key to the exercises if you join in, for free as well. These two pages belong to one website, which is run by The British Council, so expect the language to be British English, and of a good quality, on par with the BBC websites. OK, this is it for today, but we shall look at some ways of acquiring vocabulary and improving it in our next issue. [Co] = coordination; [Sub] – subordination; [Ad] = adverbial link. You can find more information about these and how to use them in Issue 025 Here you will find some easy ways of linking your sentences which not many people use in daily life. It would be an improvement in your English, if you started to actively use these expressions – trust me! [Ad] [It doesn’t matter how much advice we give him], [he (still) does exactly what he wants] Note that coordination alone cannot indicate condition + contrast. [Wherever he goes], [he makes friends.] . What we’re saying here is that the statement in the main clause is true on any of the conditions covered by the subclause. Again, the contrasting meaning is present, as the sentence implies that ‘he will favour the winner, even if that winner will be someone who is rather unpopular’. Step 2 - Complete the full brainstorm process on your Site Concept. Previously we chose our Site Concept and deleted all keywords related to the other Seed Words. We now have an excellent starting list of keywords that contain our Site Concept Keyword, many of which will be the topics of future content pages. These are our vertical brainstormed keywords and they are usually your most important ones. Lateral brainstormed keywords can stimulate new ideas for our niche, perhaps even give us a better idea for a niche, and will add depth to our Master Keyword List (i.e., more topics to write about). So let's proceed with a lateral brainstorm. We will... 1. 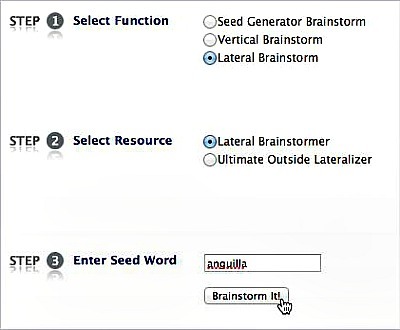 Lateral brainstorm to grow your Master Keyword List (i.e., find keywords that are related to our Site Concept Keyword, but that do not contain your Seed Word). 2. Delete irrelevant lateral keywords. 3. Blend with vertical keywords that are already on our MKL, from our previous vertical brainstorm activity. Once you’re there, enter your Seed Word. When the Lateral Brainstorm completes its work (which takes a few minutes because it visits the top 200 sites found in Google), we are sent to the MKL again. Don't be surprised at the incredible variety of lateral keywords. There's some garbage to delete, but some excellent new keywords, too. Consider each as a surprise gift, an opportunity/idea for content creation, from a webmaster whose site is in the Top 200 at Google for a search on our Site Concept Keyword. We must pay attention before we delete the irrelevant junk. After that, we need to blend with Vertical Keywords (on the KML from before), to give us two strong sets of keywords. We now have a consolidated Master Keyword List that makes our upcoming keyword evaluation and additional research much easier. We shall look into this next time and it won’t take long before we can work with our Site Content Blueprint – the matter we started in our last issue.